New York (AP) – The conditions placed on director Vitaly Mansky for shooting a film in North Korea were severe. For what was ostensibly to be a “documentary,” North Korea would supply the script. The state would choose the subjects, too, as well as the location of all scenes. He would be accompanied at all times by several state officials who would control the production. And North Korea would have final say on any footage that was used. Yet even in these impossible circumstances, Mansky managed to make a film that gives a haunting and rare look into North Korean life and the stranglehold the country’s totalitarian regime has on its people. Once it became clear how restricted he and his crew would be, Mansky resolved to let the camera run before and after a scene, capturing the government handlers’ manipulation of daily life: propaganda in action. “Under the Sun,” which is expanding in limited release, may be a small window into North Korea, but it’s enough to see an expansive tragedy. In the North Korea of the film, not just supposedly real scenes are orchestrated, all of life is stage-managed. It’s centered on a family intended to be representative. 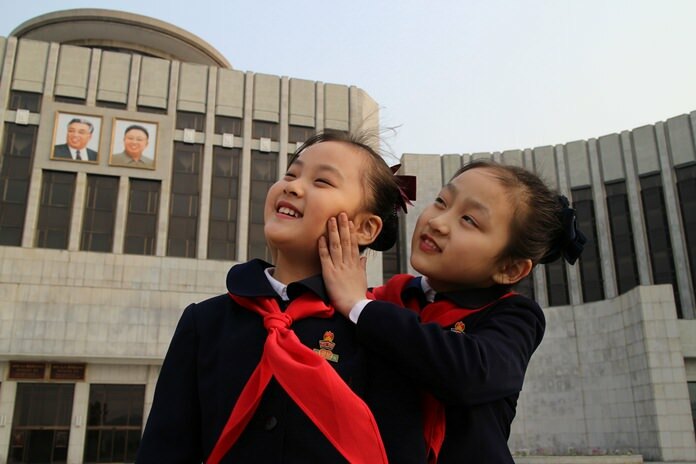 A couple’s 8-year-old girl, Zin-mi, is preparing to join the Children’s Union, a militaristic youth group that all North Korean children pass through. Mansky, who grew up in Soviet Union-controlled Ukraine and has made films about living under totalitarian and communist regimes his life’s work, expected to find signs of quiet rebellion but witnessed only complete indoctrination. He came away troubled by what he called a nation without private life, utterly unaware of life outside their country. Since censors checked their film daily, the filmmakers smuggled footage by making duplicate memory cards. Every night they barricaded their door with furniture and kept the backpacks containing the footage near their beds. In their Pyongyang hotel room, they spoke in code. Before the project was completed, the North Koreans denied Mansky a planned final trip to the country, and so he edited what they had. The resulting film culminates in a devastating scene where Zin-mi is asked what joining the Children’s Union means for her. She responds that she’s now responsible like an adult and expected to serve “the Respected Leader.” She begins to cry. Handlers urge her to stop and “think of something good” but she can’t imagine anything. Instead, she recites a poem about North Korean leader Kim Jong Un. “Under the Sun” did draw North Korea’s attention, Mansky said.